More than 80,000 items — including an auction of rare books — will be featured in the 23rd annual Summer Book Sale at the Westport Library starting next week. The event runs at the library and its grounds from July 18 through 22, with the following schedule and pricing: Saturday and Sunday, July 18 and 19, from 9 a.m. to 6 p.m., prices as marked; Monday, July 21, from 9 a.m. to 6 p.m., everything is half-price, and Tuesday, July 22, from 9 a.m. to 1 p.m., remaining items are free and donations also accepted. The items span more than 50 categories, from art to zoology, according to sale organizers. 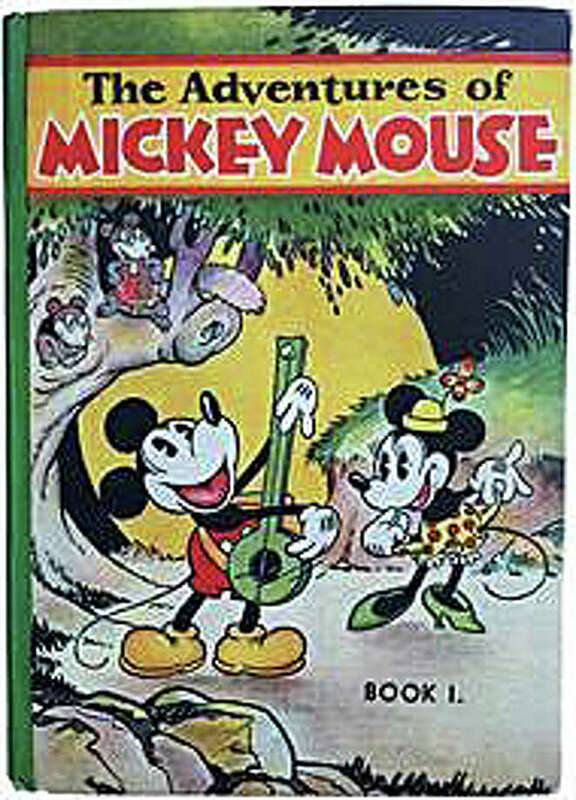 Disney’s “The Adventures of Mickey Mouse.” Published in 1931 with a rare dust jacket, this book is considered the first appearance of the cartoon character Mickey Mouse and also marks Donald Duck’s first mention in print This title sold last fall for $5,500 at a New York auction house. Colton’s “General Atlas.” Published in 1872, this atlas has 180 steel-plate maps, including many in still-vibrant color, and is considered the best American atlas of its day, the library says. It is in a leather-trimmed binding. Other special books will be offered, including a first edition of “Goodbye, Columbus” and “Five Short Stories” by Philip Roth; a first edition of “Grace: Thirty Years of Fashion at Vogue” by Grace Coddington and Michael Roberts, and the first American edition, second issue, of Sir Isaac Newton’s “Principia,” 1848. All featured books are listed at http://westportlibrary.org/support-wpl/book-sales, and many, including the two auction books, will be on display in the library in the days leading up to the sale. In addition to the featured specials, the art and photography books will be inside as well. Also available will be a selection of books about the Middle East donated by a retired Mobil Oil executive and a large collection of sheet music. The sale also will offer comic books, graphic novels and foreign books, including some in languages not commonly seen, like Hindi and Egyptian hieroglyphics. The tents on Jesup Green will house a range of hardcover and paperback fiction and non-fiction books as well as vinyl records, DVDs, CDs and audiobooks. Children’s books will be in a separate tent, with some of the library’s children’s librarians on hand to help. Doors open at 9 a.m. each day of the sale, and there will no computer sign-ups or place holding. For early arrivals, library restrooms will open at 7 a.m. Saturday, as will the outside café booth, which will sell beverages and snacks. Featured specials will be accessed by specific lines to enter the library. Admission to the sale is free. Visa, MasterCard and American Express are accepted, as are checks and cash. Book donations to the library are welcome year-round. They can be brought to the circulation desk, or call 203-291-4840 to arrange to have the donations picked up.